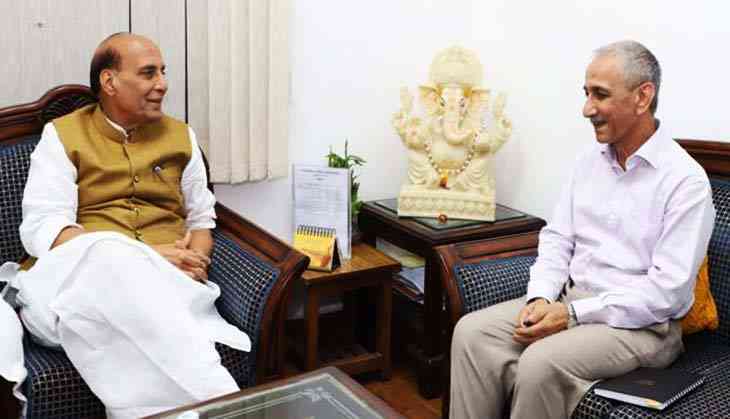 The appointment of former Intelligence Bureau Chief Dineshwar Sharma as the Home Ministry’s Special Representative for Jammu and Kashmir has failure written all over it. It is unlikely to lead to a solution of the crisis that Kashmir faces. The reasons for Sharma’s appointment are unclear. His brief is hazy. And he has no political mandate. Sharma has not been appointed because the Modi government felt the need for a political settlement. In fact, despite the homilies about Kashmiris needing hugs rather than bullets, this government believes that its strong arm methods have already borne fruit and the situation is normalising in the Kashmir Valley. The Army Chief has even boasted that by the year-end the remaining armed militants in the Valley will be finished off. He has also said that the army action against militants will continue despite the dialogue. Under these circumstances, two factors may have led to the appointment of Sharma: US Secretary of State Rex Tillerson’s visit to India; and the need to shore up the dwindling legitimacy of the Mehbooba Mufti government. The appointment of Sharma as the Home Ministry’s special representative has taken place on the eve of Tillerson’s back-to-back visits to Pakistan and India. In August this year, Tillerson had said, “There are areas where perhaps even India can take some steps of rapprochement on issues with Pakistan to improve the stability within Pakistan and remove some of the reasons why they deal with these unstable elements inside their own country”. Dineshwar Sharma’s appointment is one such step. It would stave off US nudges, if any, on resolving the Kashmir tangle. It would also project India as a reasonable state ostensibly willing to talk to the Kashmiris, while cornering Pakistan as the exporter of terrorism and armed militancy in the Kashmir Valley. Jammu and Kashmir Chief Minister Mehbooba Mufti, whose government’s legitimacy is eroding by the day, also needed a face-saver. She had met Union Home Minister Rajnath Singh on October 17 in Delhi. Following that meeting, a few hours later on the same day, the National Security Advisor, the Home Secretary and the Director of the Intelligence Bureau reportedly paid her a visit. They discussed the possibility of appointing a Special Representative for Kashmir along with a short-list of names. Appointing a political personality was apparently ruled out as that would make the dialogue process high profile. After much deliberation, a former policeman and IB Director, Dineshwar Sharma, was chosen for the job. While the US Secretary of State may feel pleased that his advice has been heeded, Sharma may not be able to shore up the legitimacy of the Mufti-led coalition government. By saying that he will talk to all “Indian citizens” in the state, even before he visits the state, Sharma has already circumscribed his ambit of his dialogue. Separatists may not, for example, consider themselves Indian citizens. It is another matter that Hurriyat leaders will in all likelihood refuse to meet Sharma. This is what they did with the previous interlocutors appointed by the government. Should Sharma attempt to exceed his already ill-defined brief (a very unlikely prospect, as he is known to be a rule-bound bureaucrat), there will be others who will beat him back to the straight and narrow. Raking up the abolition of Article 370 or Article 35A can bomb any dialogue. The Khaki militia of Nagpur knows that pressing these two buttons can ruin any prospect of normalcy in Jammu and Kashmir. Who then will Dineshwar Sharma dialogue with? The stone-pelters have no specific leadership and even if they had, there is no reason for them to entertain him. Whoever he meets will all ask him the same basic question: What is it that you can do for Kashmir which previous interlocutors could not do? To this, he will have no credible answer. The late KC Pant who was the first interlocutor for Kashmir, went to each region of the state once and came to the quick conclusion that his errand would not lead to anything. He never visited the state again. NN Vohra, the current Governor of the state, was also a Kashmir interlocutor in his previous avatar. He was kept so out of the loop that Kashmiri separatist leaders would come and meet the government in Delhi and he would not even be informed. He visited the state a few times but nothing came out of his efforts either. He tried to resign twice but was kept sitting on the bench till his appointment as Governor. Then came the appointment of another group of interlocutors for Kashmir -- Dileep Padgaonkar, MM Ansari and Radha Kumar. Considerable effort and money was spent in taking them to all parts of the state to talk to the people. Their report, prepared with a lot of effort, was finally not even placed in Parliament. The fact is that there is nothing that the government doesn’t already know about the ground situation in Jammu and Kashmir. No interlocutor can make any new revelations after visiting the state. Dineshwar Sharma’s lack of political authority is also apparent. He has clearly stated that his attempts at starting a dialogue and the investigations of the National Investigating Agency (NIA) into hawala funds being received by some Kashmiris, including separatists, are two parallel tracks. One agency is harassing and tearing the reputation of prominent Kashmiris to tatters and someone else is being told to hold a dialogue with them. If the government wants to make an example of one or two big fish in the hawala racket, it should certainly do so swiftly. But a trawling operation can become counterproductive in more ways than one as many of those questioned may have been part of the vast information network of India’s own intelligence agencies. There is a cost to pay for one agency destroying the sources and information network of the other. However, unfortunately Dineshwar Sharma has no authority to moderate or modulate the actions of the NIA for the larger objective of stabilising Kashmir. Finally, it is beyond his brief to engage with Pakistan or persuade the government to take such an initiative. If the Hurriyat leadership, the other recipients of hawala money, Pakistan, the stone-pelters, and safeguarding Article 370 and 35A are all ruled out of a dialogue, then how on earth is Sharma then going to engage all stakeholders in a sustained dialogue? And what would such a dialogue address?